Gygi’s Culinary Arts Center is stacked with every amenity a chef would fancy. We use high-end appliances, top-of-the-line cookware, and work with experienced chefs who have a passion for cooking and teaching. Our goal is to provide a truly enjoyable, entertaining, and educational experience for everyone who steps foot into our Culinary Arts Center. Gygi strives to provide a genuine hands-on experience. By capping our classes at their appropriate sizes we ensure an individualized kitchen experience. We want everyone, from the novice chefs to the masters, to enjoy their experience. We work hard to have a great class ready for you to get your hands a little messy. Gygi’s Culinary Arts Center also has a theater-style demonstration kitchen, which has awed and inspired hundreds over the years. This kitchen sees many events throughout the year, including our Chocolate Extravaganza weekend where we offer an array of classes all weekend all about chocolate. 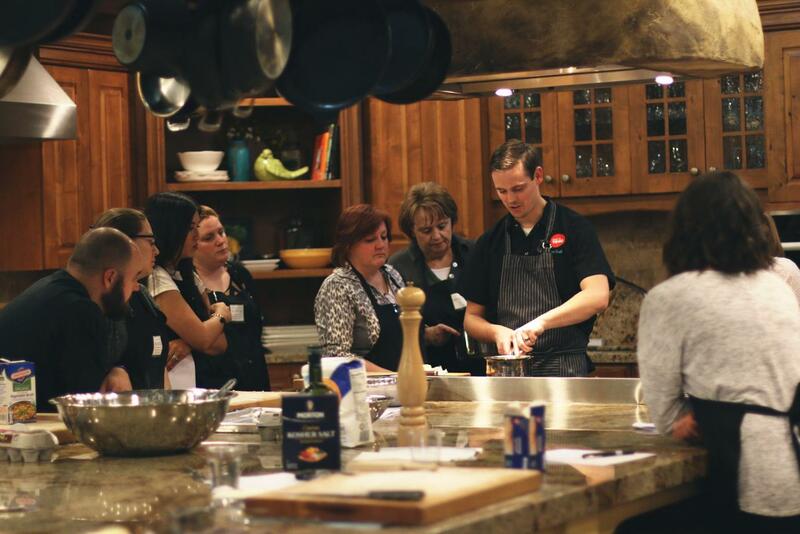 We also use our demonstration kitchen for private events and demonstration-styled classes. We welcome everyone to join one of our classes, explore our Culinary Arts Center, come in and say hi, or just drop by for any of your kitchen needs. We look forward to seeing you!